My husband and I try to step up our cooking skills with each camping trip. We’ve made cedar-plank salmon, baked lots of breads and more roasted chickens than you can shake a stick at, but on this trip we focused on some of the sweeter things in life: baked apples. 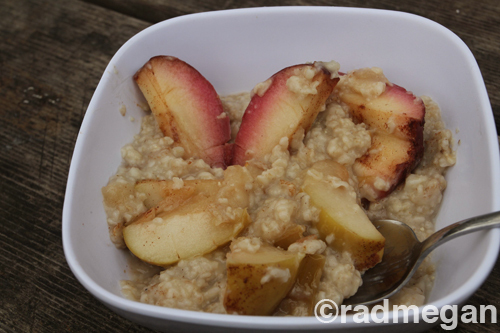 I really wanted to incorporate more fruit and veg in each meal, so when I proposed baked apples to top off our morning oats, I didn’t realize how easy it would be to do while camping. I suggest starting your fire or lighting charcoals first so that they have time to get red hot while you prep the apples. 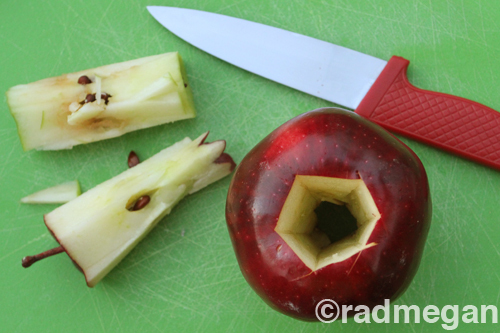 Core the apples and score the skin multiple times with the tip of a sharp knife. Place one apple on a sheet of foil, and with about a tablespoon of butter, completely coat the skin. Place the remaining pat of butter in the center cavity. 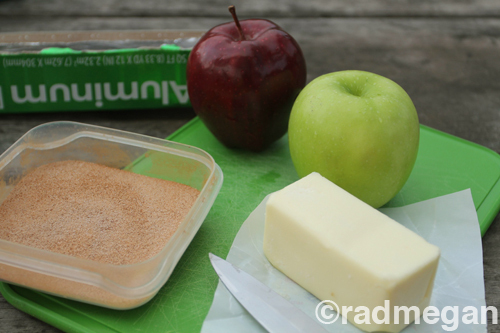 Sprinkle the cinnamon and sugar mix around the apple and into the center. 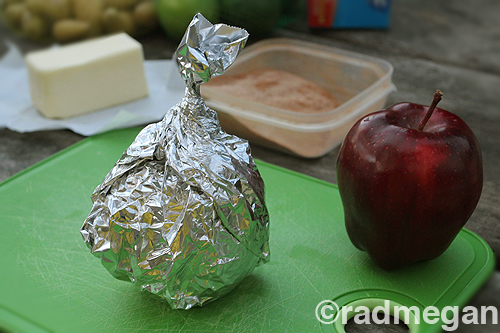 Wrap the foil sheet around the fruit and give it a twist at the top. When your coals are red and glowing, they are ready to cook on. We started our apples on the coals of another meal, baking in our Dutch Oven. When the Dutch Oven came out of the fire pit, we set the apples straight onto a pile of glowing charcoals where they stayed for about 45 minutes. We turned them with metal tongs two or three times to ensure they would cook evenly. I want to mention that cooking directly in the flames of a fire is not going to work NEARLY as well as using coals (either charcoal briquettes, or the red glowing embers from a fire) these are both hotter and more consistent for cooking. We baked our apples on Friday night for breakfast on Saturday morning. One of the important things about camp cooking is time management. In the mornings we like to spring out of bed (depending on the outdoor temperature) and get our day started, so we personally don’t like to spend a lot of time on breakfast. 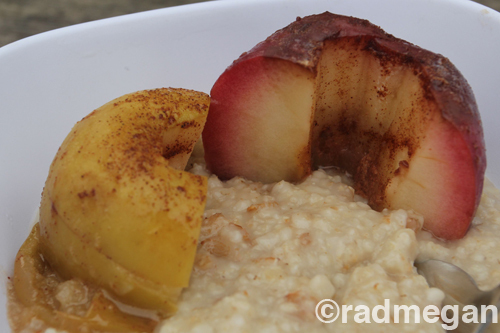 We warmed up our foil-wrapped apples in a saucer over a propane burner, and cut them up over a piping hot bowl of quick oats. Heating them up again took only a few minutes. Extra cinnamon and sugar was at the ready in case we needed a little extra boost of sweetness, but the apples were so beautifully cooked that the natural juices plus the trace amounts of butter and spices were all we needed to kick off a great day of hiking! 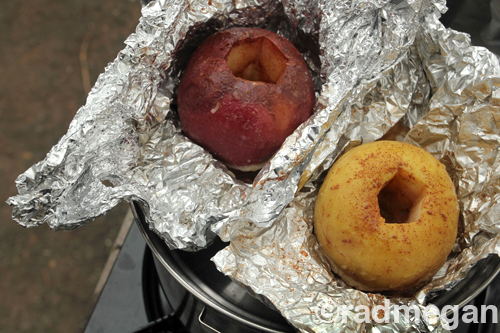 Putting together the ingredients for baked apples (or baking any other seasonal fruit) takes no more time than throwing a re-sealable box of sugar and cinnamon in the car along with the rest of your camping gear. 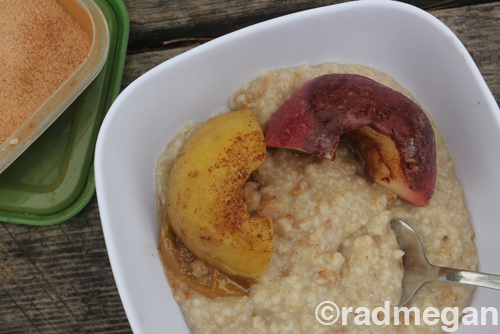 With a few minutes of prep at dinnertime, you can have a hearty breakfast that tastes great, incorporates a subtly sweet dose of fruit, and sets the tone for a happy and healthy day outdoors! Looks yummy. If this can be cooked over a campfire I should certainly be able to do this in my oven or microwave! I absolutely love the idea of grilling the apples! That has to give it fabulous flavor! 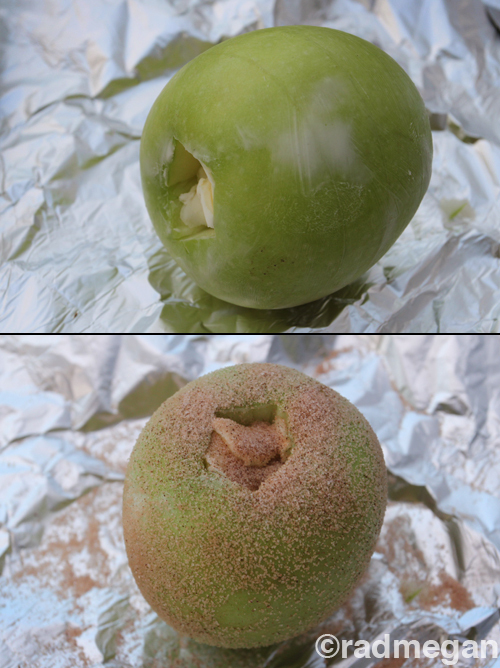 I have this pottery piece that is used for making these same type of apples… except I put it in the microwave. It’s a really neat piece! 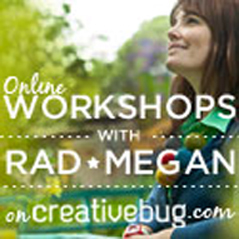 I love using it especially in the Fall! However, I seriously will have to scrap the pottery piece to try putting the apples on the grill!! YUM! I love that you said “sharp knife”. I was going to grab the dull, rusty knife until I read that. 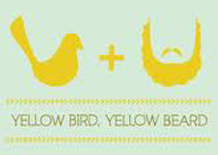 I love the recipe. Amy- you could totally make these in the oven! I’d try 350 degrees for 45 minutes. Microwave cooking is not my specialty, but if you try it and it works, let me know! Lindsay! I’m unfamiliar with what this pottery thing is you speak of, but it sounds cool! Yes girl, get the grill going! 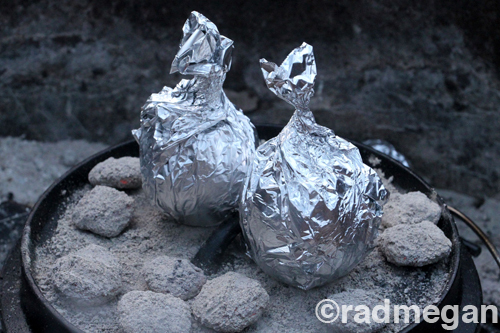 What kind of dutch oven would you siggest for camping….I dont want it to be fancy….When you mention coals are you fishing them out of the fire from the night before??? ?